Security orchestration methods, and of course SDN, are driving the need for programmable interfaces in security products. 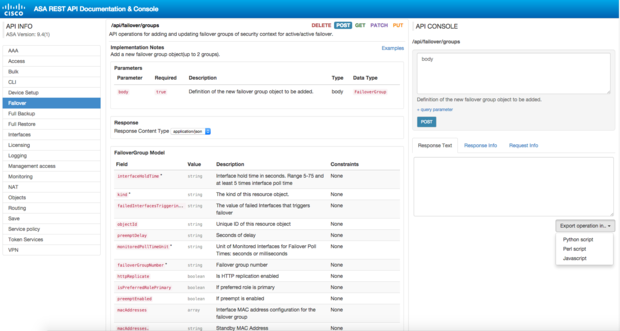 The Cisco ASA Firewall added a REST API back in December with the 9.3(2) code release. I've asked Mason Harris from Cisco to write up a quick how-to primer on the ASA API capabilities. Thank you Mason for the great information. 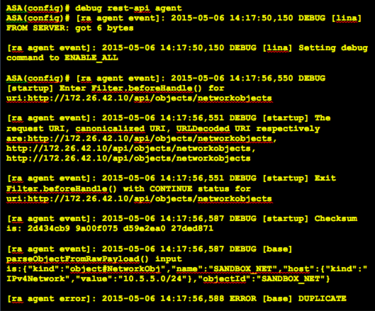 Historically the ASA has been a closed platform in the sense syslog has been the only choice for event management. Last year a fully functional virtualized ASA (ASAv) was introduced with the ASA 9.2.1 release. Combined with this virtualized offering and the increase in Sofware Defined Networking (SDN) and Network Function Virtualization (NFV), the next logical step was for Cisco to develop an API to programmatically manage an ASA firewall. This gives customers a very flexible platform where common elements could be created and repurposed to orchestrate and automate deployments. Additionally, the ASA HTTP server functionality must be invoked to start the listener process and there must be at least one local user with privileges to invoke the REST calls. 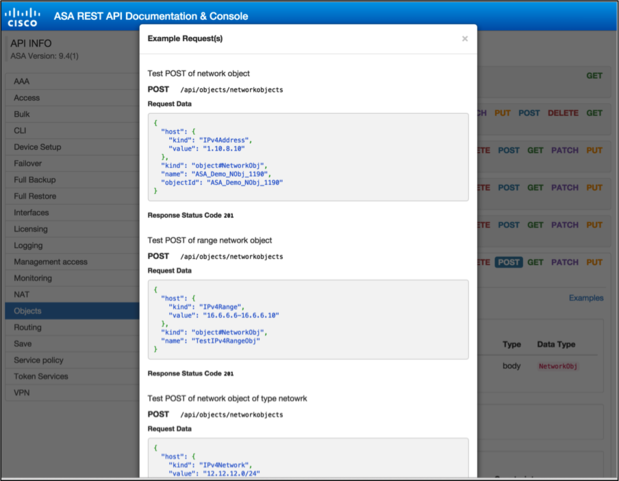 For details on the ASA REST API configuration, see here. In order to test some of the capabilities of the API, a browser plugin is required that will be able to act as the REST client. 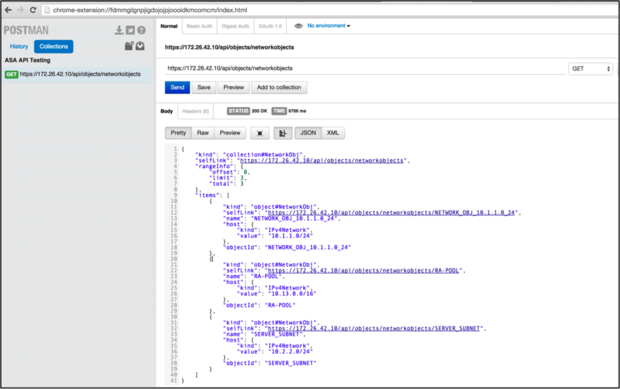 In my lab I'm using Postman, which is a great tool for testing APIs. Once the basic setup is complete, I recommend examining the API documentation package at https://<ASA_IP_Address>/doc. This utility gives a brief explanation of each call and also offers an export capability to Python, Perl, or Java. 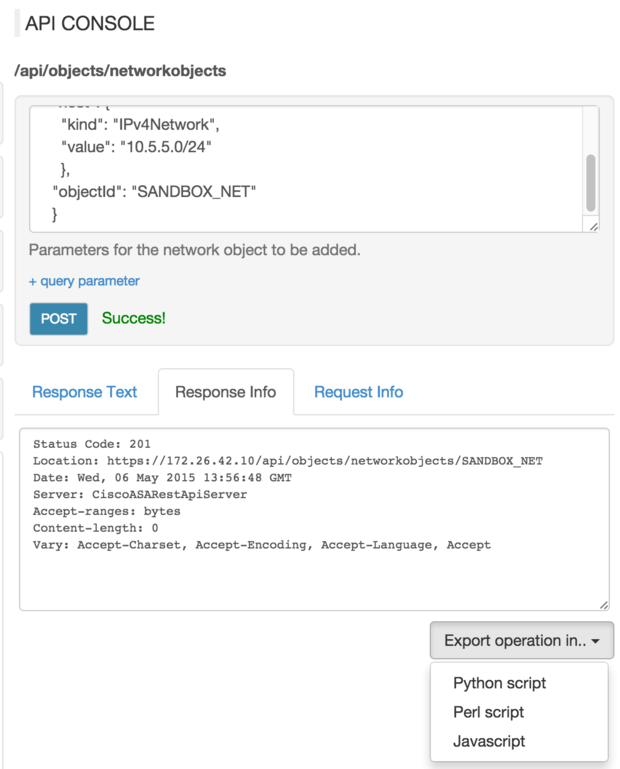 Let's add a fourth network object on the ASA called “SANDBOX_NET”. Note that the network objects are not required to be in all caps, this is just for readability in the ASA configuration. 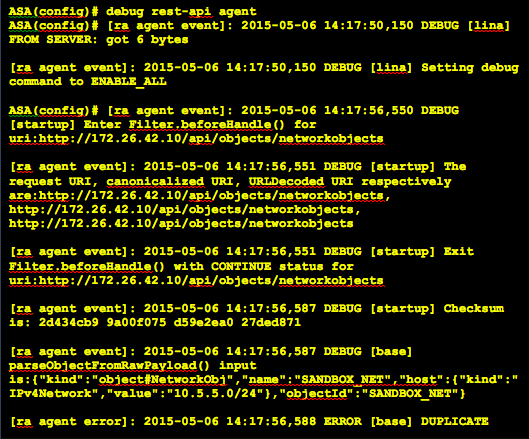 And finally to verify that the new “SANDBOX_NET” object was actually created. As can be seen from the output, the network object “SANDBOX_NET” already exists and is being rejected as a duplicate entry. for more information on REST, click here.